There is little doubt as to Wall Street (and London) shrinking but nobody seems to be able to come up with an explanation for it. Typically willful blindness is the reason, as investment banks no longer want the duties but that just isn’t consistent with what is supposed to be a roaring economy. If anyone were to make out under such a situation, it would be investment banks especially those with heavy FICC infrastructure already in place (“global franchises”). The contradiction, then, is how investment banks are purposefully avoiding Janet Yellen’s once-in-a-generation invitation. That is why it “has” to be regulations; that and the desire to promulgate the idea that regulators are now tough Wall Street sheriffs unlike their uninterested behavior prior to 2007. 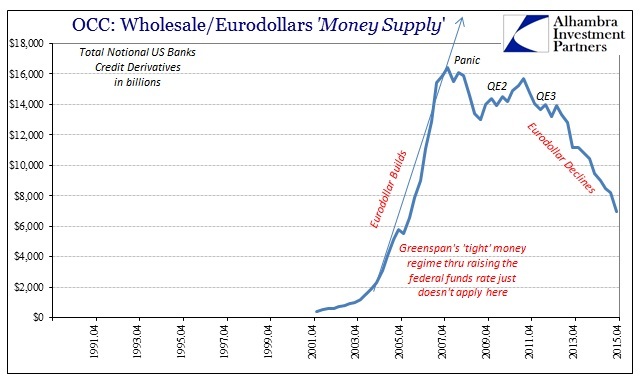 As noted on previous occasions, it leads to more absurd and even bizarre attempts to justify the increasingly extreme loss of “money dealing” capacity as still somehow consistent with both the recovery and the “resilience” of the global financial system. (that, obviously, hasn’t been so resilient of late). 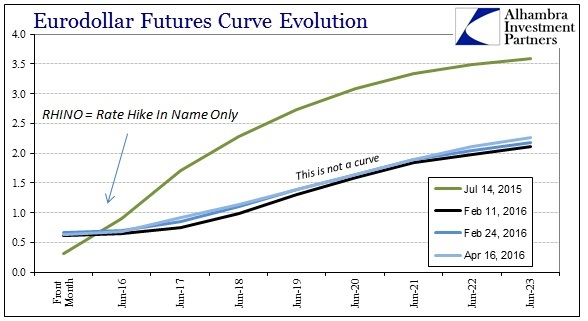 The Office of the Comptroller of the Currency in its quarterly report on bank derivatives suggests the reason for the dramatic decline in at least gross derivative exposures is that central banks have been “too” successful in their efforts to banish risk. The general decline in notionals since 2011 has resulted from trade compression efforts, as well as the lower volatility environment, which has led to less need for risk management products. Assuming that is correct, ignoring the conclusive evidence that it is not, by this view investment banking should also be booming. Not only do we have Janet Yellen declaring the Fed’s work almost surely done but also “global turmoil” to accompany it (the conclusive evidence). The mainstream makes no effort to reconcile the contradiction but in this ceteris paribus exercise those are two factors that together should lead to very good times for global banks, especially wholesale, investment (formerly shadow) banks. 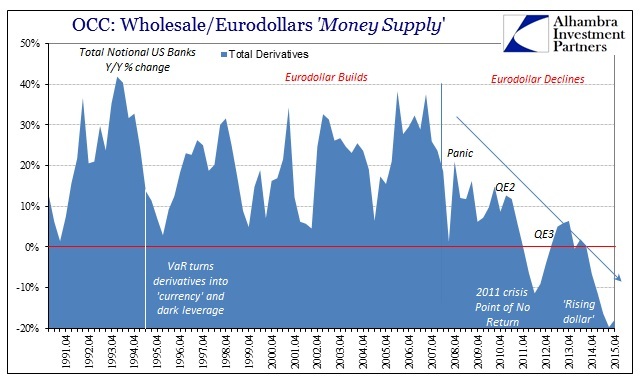 As the global eurodollar banks report Q1 earnings, there are only degrees of further ugly. Morgan Stanley has been, unsurprisingly, among the worst. The record for worst Q1 may not last very long, as Goldman Sachs will report results tomorrow morning that are suspected to be disastrous. As of this morning, analysts are predicting $6.73 billion in revenue vs. $10.6 billion last year. JP Morgan, which reported last week, saw total revenue fall 3% to $24.08 billion but that included a 24.5% drop in investment banking bailed out by the traditional bank segment (for now; exposure to not just US but foreign junk and energy is still a matter to be settled). Like Q4 is to retailers, Q1 for FICC gatherers is the most important quarter. MS CEO James Gorman said last year of Q1 2015, “This was our strongest quarter in many years with improved performance across most areas of the firm. It reflects our ongoing strategy to build platforms for growth while maintaining a prudent risk profile and disciplined expense management.” In other words, something really changed between then and now. Morgan Stanley executives took last year’s start as an end to the prior slump when instead this year’s start only suggests the same slump but much worse and conclusively so (which is why MS laid off so many in FICC in Q4). Analysts forecast a 20 percent decline on average in earnings from the six biggest U.S. banks, according to Thomson Reuters I/B/E/S data. Some banks, including Goldman Sachs Group Inc, are expected to report the worst results in over ten years. If they can’t make money during periods where they “should” be making the most, it doesn’t suggest anything good about how they will continue to respond. 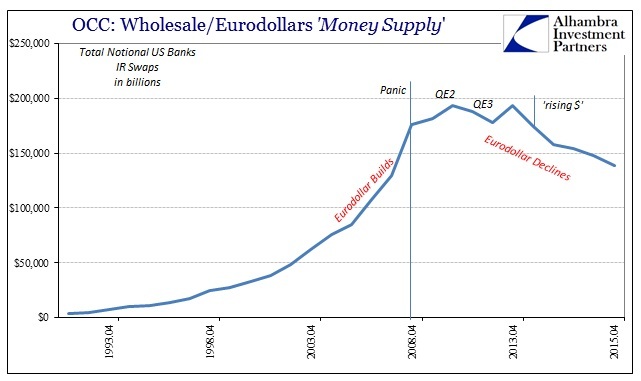 As the banks go, the “dollar” goes; as the “dollar” goes the global economy has followed. Bank earnings from Q1 2016 suggest that self-reinforcing stage where the “dollar” harms the economy which only further harms the “dollar” and so on. The real problem is that we are almost two years into this direct process (having been warned in the years before it) and are no closer to seeing or suggesting any kind of resolution.